From the meals in the dining room to the buffet choices in the Windjammer Cafe to the options available at the 24-hour Cafe Promenade, the food is consistent and well prepared, especially considering the capacity of the ship. And options are pretty plentiful. 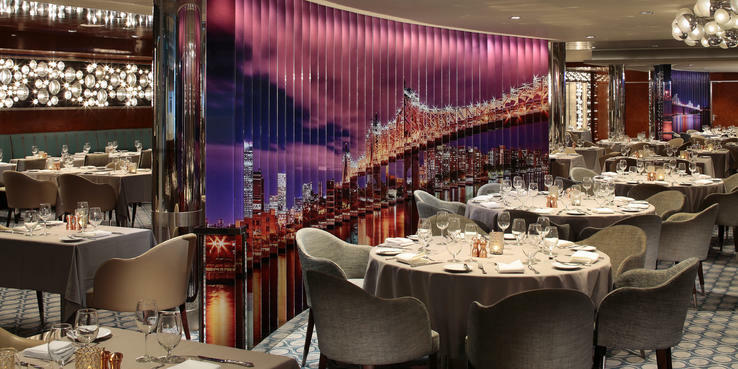 Three main dining rooms offer Royal Caribbean's flexible My Time Dining program during dinner. Passengers can choose between assigned early (6 p.m.) or late (8:30 p.m.) dining, or opt for flexible dining, in which you pick a preferred mealtime (anytime between 6 and 9:30 p.m.), but can change your reservations on a daily basis or walk in when you're hungry. (Note: Those choosing My Time Dining must pre-pay gratuities -- Royal Caribbean does not automatically add gratuities to your final bill if you've elected set-seating.) Cuisine is generally well prepared, if not innovative; Royal Caribbean doesn't pretend to be a gourmet-dining cruise line. Each menu includes healthy fare options, vegetarian dishes (at least one, like vegetarian chili, but sometimes there's an Indian vegetarian dish in addition) and a standard in-case-nothing-else-appeals selection of entrees (rigatoni with marinara sauce, Atlantic cod, chicken breast and black angus top sirloin). Breakfast and lunch are open-seating, though you shouldn't take that to mean that you can always snare a quiet little table for two. The Windjammer, Adventure of the Seas' buffet restaurant, is open for breakfast and lunch, and it features mediocre, steam-table cuisine. Kudos must be given, however, to the egg station at breakfast (where you can request a variety of prepared-to-order dishes) and the carving station at lunch. Baked goods are consistently excellent. Vegetarians will do much better in the main dining room at lunch. The Windjammer is also open for dinner and is an option for those nights when flexibility is preferred. The buffet features the same items as are on the main dining room menu. Specialty eateries include Johnny Rockets, the 1950's-style burger joint; passengers can indulge in burgers, hot dogs, chili fries, apple pie and onion rings. Royal Caribbean has instituted a $6.95 per-person cover charge for both in-restaurant and take-out dining (and beverages -- including shakes -- are additionally charged). On the Royal Promenade, the Cafe Promenade features light fare at all times (pastries in the morning, sandwiches at night); try the pizza, it's excellent. Royal Caribbean's room service options are available around the clock via 24-hour menus that offer a range of snacks and sandwiches. At breakfast, Continental dishes, along with a handful of egg entrees, are available both in cabins and suites. Only the Continental breakfast is available without a charge; all other orders carry a $7.95 surcharge (regardless of how much you order).